Disability and addiction are very often closely linked. Data from the National Rehabilitation Information Center indicates that nearly five million people with disabilities suffer from co-occurring substance use disorder (SUD), accounting for nearly a fifth of the overall population of SUD sufferers in the United States. Like other types of co-occurring disorders and dual-diagnosis issues, addiction and disability can switch roles between cause and effect. Many SUD sufferers end up developing physical or psychological disabilities as a result of their prolonged and untreated drug or alcohol abuse; others start using drugs or alcohol as a direct means of coping with a disability. 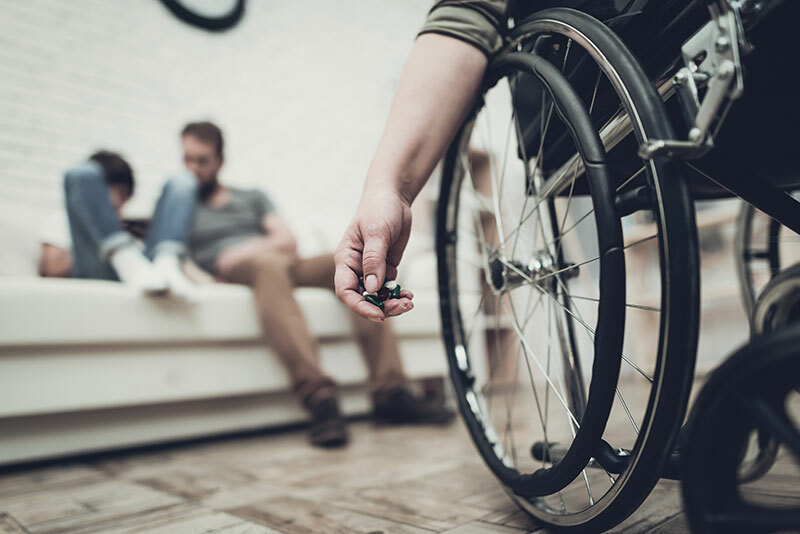 Addiction Treatment for people with disabilities must simultaneously address the physical and psychological effects of the substance abuse while ensuring the patient gets adequate care for their co-occurring condition. There are different levels of disability and it's important to realize that with the right care, all people can have a rich, full and rewarding quality of life. There are several distinct paths to addiction from disability, and vice versa. It's very common for people facing physical disabilities like limb loss or spinal issues to use painkillers to cope with their pain; some even use alcohol. The Amputee Coalition of America reports that those suffering from limb loss face a particularly high risk of opioid use disorder (OUD). Other data reveals that between 40 and 50 percent of persons with visual impairment can be classified as heavy drinkers. One recent study from the University of Washington reports indicates that those with spinal cord injury are at significantly higher risk for drug or alcohol use disorder. Acute pain and other physical symptoms commonly associated with physical disability create a clear pathway for self-medication with drugs like marijuana and prescription opioids. Much like physical disabilities, psychological impairments can either cause or result from substance use disorder. Data from Psychology Today indicates that those with autism symptoms are at increased risk for drug and alcohol use. Those with moderate to severe trauma and anxiety diagnoses (both classifiable disabilities) are also at increased risk for substance abuse. Around two thirds of PTSD sufferers develop corresponding substance abuse use issues, according to recent data published in TIME. The Substance Abuse and Mental Health Services Administration (SAMHSA) reports that anxiety is the most common mental health issue associated with substance use. Other types of mental disabilities that can be linked with addiction include schizophrenia and bipolar disorder. It's also common for individuals who suffer disability late in life to experience trauma and depression and self-medicate with drugs or alcohol as a result. 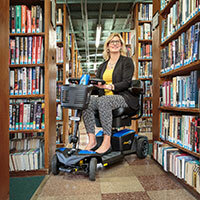 Individuals with disabilities face a special and unique set of physical and emotional obstacles that can inhibit care. This is especially true for those suffering serious visual and hearing impairment and wheelchair users. The reality is that out of the roughly 14,500 treatment facilities currently in the United States, only a fraction are equipped to treat the unique care needs of blind and deaf clients. Organizations like Deaf off Drugs and Alcohol (DODA) and the Center for Deaf-Blind Persons can link visually or hearing impaired SUD victims to quality treatment resources. Throughout each phase of the addiction treatment process, special attention and care must be given to the client's disability, whether it's providing mobility assistance for paraplegics or accommodations for the deaf and blind. After a medically supervised course of detoxification and withdrawal management, patients should undergo behavioral rehab to explore the emotional link between their disability and substance abuse. Once patients complete treatment, it's critical that they receive ongoing care and therapy for both their disability and substance use issue; aftercare plans designed by patients' treatment facility can provide a management template to manage both of these conditions. It's no secret that those with physical and psychological disabilities face a heightened set of challenges in their everyday lives. There are, however, more resources than ever to help persons with disabilities maintain a rich life, manage their health and develop a sense of personhood and autonomy to which everyone is entitled. Get the help you need for your substance abuse today, regardless of your disability.